2018 Weeks Available: 5/13, 5/20, 9/30, 10,7, 12/9 & 12/16 - Sunday to Sunday each week. Picture perfect first floor, 1,350 sq. ft., corner, luxury villa overlooking lagoon and fairway offers a golfer's/tennis player's/beachcomber's dream! 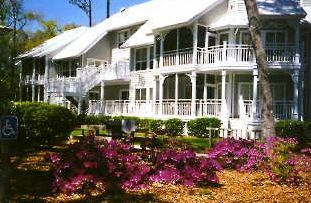 This RCI Gold Crown Westin-maintained villa offers privacy, charm and access to Hilton Head's outdoor paradise. Guests can walk to the public beach or to the Westin Hotel beach at Hilton Head's premier resort for a full range of services, health club, dining and night life. Port Royal Plantation's two golf courses are ready for your perfect round (green fees for four are free each day and and you pay only cart fees) plus you can also choose to play at three other courses on the island as part of your golf privileges. Tennis fees for 4 are included daily. Ocean Palm's pools provide both the excitement of a large pool, or the privacy of two mini pools, all with adjacent outdoor hot tubs. You are also encouoraged to use the gorgeous pool and garden area at the Westin Resort, with towel service, chairs, outdoor dining, etc. You'll have plenty of parking for your car just outside your villa. You can also rent a bike at the tennis club or use Ocean Palm's free shuttle to and from the resort and golf center. Hilton Head offers a wide range of activities from nature walks, water sports and fabulous shopping! Dine in one of Hilton Head's over 125 restaurants or cook in your beautiful, fully equipped kitchen. Each bedroom has it's own TV and bath with a jacuzzi tub. A large flat screen TV, radio and wet bar in living room make entertaining a breeze. Free Wi Fi service within the villa. At the end of the evening, sit on your screen porch, overlooking a lagoon with a glass of wine and some moonlight. For night life, there are many clubs and pubs. Early in the morning, before your round of golf, enjoy your coffee in the spacious catheral ceiling living room. Personal laundry facilities are in your villa. We are a very active couple who enjoy golf, tennis, biking, beaching, dining with friends. He says he likes the golf choices, she says she likes HH's active community, shopping and social life. The children and grandchildren love it all!! The kids say they like the weather in HH and the grandkids love the beach, viewing the wildlife and fast food. Hilton Head offers the best value for vacation dollars. Whether you're a golfer, beacher, tennis player, shopper, diner or loaf-about, this is the perfect location. The ammenities of the Westin Resort, including the health club, insure a great week no matter what the weather. We golf almost daily. We step outside our unit for a quick game on the tennis courts. We walk to the beach. Visit the Westin. Watch the turtles in our lagoon. We dine out at one of Hilton Head's more than 100 resturants, but have the option to cook in. We love to entertain in our unit because it is spacious, light and has two porches (screened and unscreened) for gathering. Both bathrooms are large and each features a jetted tub. You are .3 miles from the Westin Beach and within walking distance to one of Hilton Head's public beaches. You have access to all the amenities of the Westin Resort, Including the free shuttle that will take you to the hotel, beach, pool and restaurants at the hotel and to the golf courses of Port Royal. You are on the Barony Course of Port Royal, one of five courses where you have free greens fees. You look up the 8th fairway of the Barony Golf Course from inside your living room and from the screened porch. You are overlooking a 50' lagoon and up the 8th fairway of the Barony Golf Course (200 yards). Your washer/dryer are in a separate closet off the kitchen. Your parking spaces are right next to your entry porch. Spacious vaulted ceiling in this "open concept" design pleases everyone. This large open concept kitchen allow you to prepare food, talk to your guests over the granite kicthen bar/counter area, view the lagoon and golf course and be part of the fun . Bike Racks outside your villa. You can bring or rent your bikes. About a two minute walk from you door is a shared outdoor grill. There is a small deck off the guest bedroom and a small deck off the screened porch. One hour of tennis court fees for 4 people daily. Golf greens fees for 4 people each day. Guest pays carts fee only. There are five steps to front porch from parking area. Inside the Villa is level everywhere. Outdoor small hot tub a two minute walk from villa. You can also use the Westin's large hot tub in the pool garden area. FREE Golf and tennis fees for 4 people each day (you pay only golf cart fee on your choice of five golf courses). Beautiful decor, screen and open private porches, Villa with more than 1,300 sq. ft, All Westin Resort ammenities available , Five minute walk to beach, back door parking, privacy. Two access points to the beach. Full resort services from Westin, including free shuttle to the Westin, beach and golf. Enjoy the Heavenly Spa at the Westin, HH's finest spa experience. The Westin Resort manages your villa and any needs you might have, from reservations and advice to help with a question about your villa are just an Express Service call away. Greens fees and tennis fees for 4 people daily, 5 courses, 14 courts are included. Westin Resort amenities are a short shuttle ride from your villa. Enjoy 10% off Westin resturants for food and drinks and 20% off at Island Treasurers Gift Shop and free Westin Shuttle to Westin's beach. The quiet, beautiful enclave of Ocean Palms is just minutes away from all of Hilton Head's many attractions and activities. You'll enjoy the effortless luxury of having the Westin Resort meet any additional needs you may have. Whether it's relaxing on one of your porches, playing a golf course or a round of tennis, shopping or seeking out the ecology/history of the area, your mid-island home-away-from-home will please the whole family.